At ten a.m. on October 20, 1882, a whip cracked, a horse strained forward in its harness, and Winnipeg's horse-car service was inaugurated.The first horse-car rumbled along the newly-laid rails on Main Street from the City Hall to the Fort Garry Gate. A piece of wood, lying unnoticed on the track, almost brought disaster as the front wheels of the car jumped the rails and the vehicle slid and swayed to a sudden stop. It was not for long. Willing hands and strong shoulders soon had the car back on the rails and moving triumphantly to the completion of its trial trip. Regular service began next day and the horse-cars continued to provide transportation for almost twelve years. Mr. Albert W. Austin organized the Winnipeg Street Railway Company and started the horse-car system in Winnipeg. He was General Manager and the Superintendent was George A. Young; the Engineer, George McPhillips. They rode on the opening trip with Mr. James Wilson, the man who had the honour of being the first horse-car driver in Winnipeg. Foreseeing that the growing city would need reliable transportation, Mr. Austin set out to provide it. Heretofore, only omnibuses and cabs had carried the public. Both were costly. Neither ran to a schedule. Mr. Austin provided a regularly scheduled service. When four cars operated it was a five minute headway. When only two cars were running it was ten to fifteen minutes between cars. The fare was ten cents or fifteen tickets for a dollar. On the sleighs in winter it was five cents. This was cheap transportation compared to the omnibus and cab fares. The horse-car company started with four cars and four sleighs. Power was provided by twenty fine horses from Ontario. They were stabled on Assiniboine Avenue at Fort Street. The rails for the cars were laid on closely set flat wooden ties - a safe path for the horses, and, the only place in the street that was passable after a rain or during the Spring thaws. With the service successfully started, Mr. Austin immediately completed construction of tracks to the C.P.R. at Higgins and Main. He then turned his attention to Portage Avenue and rails were laid as far as Kennedy Street. On November 11, 1883, the first passenger car ran along the new route. 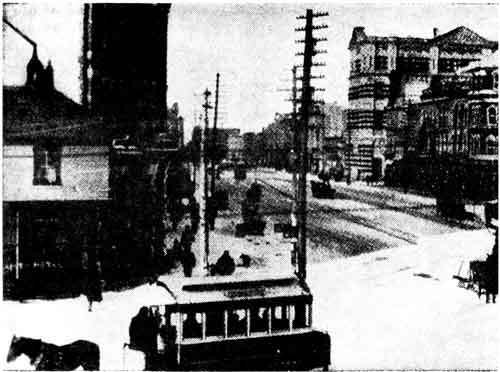 In 1884 tracks were laid along Kennedy Street to the Legislative Building at Broadway and from the C.P.R. on Main Street to St. Johns Avenue with only one break - where passengers scurried across the C.P.R. tracks to the car on the north side. But the street railway had its problems and "weather" was at the head of the list. There were no "sweepers" or "rotary plows" in the early days. When winter came rails were abandoned and sleighs took over. The car floors were covered inches deep with straw to help to keep the feet warm and the passengers found a marked degree of comfort in the closed-in vehicles. The driver had no protection - he was in the open vestibule and exposed to the biting elements. When the winter's rubble was cleared from the tracks in the Spring the cars operated on the rails again. Sometimes, after the cars were back, the weather played tricks. In 1884, a weekend blizzard swept in to kill budding plants and completely stopped the street car service. It took a large gang of men a full day to clear the tracks on Main Street and Portage Avenue. Then it thawed again and Main Street became a soggy morass. Ox-carts and all manner of vehicles used the high and dry street railway road. Pedestrians did the same. It was such a boon to them and such a nuisance to the car drivers and passengers that Mr. Austin asked the City for a $1,000.00 bonus to compensate him. He never got it, but the request wakened the civic authorities to the pressing need for paving for Main Street and, in the Fall, Mr. Logan, the Mayor, laid the first paving block. All this time Winnipeg was growing. By 1888, it became evident that more and faster transportation would soon be necessary. Mr. Austin wanted to run electric cars. The City Council, fearful of suspended electric wires, was reluctant to grant permission. Finally they gave way under pressure and the first electric street car went into service in 1891, not on Main Street in Winnipeg but, on River Avenue, in what was then called "The bush of Fort Rouge." 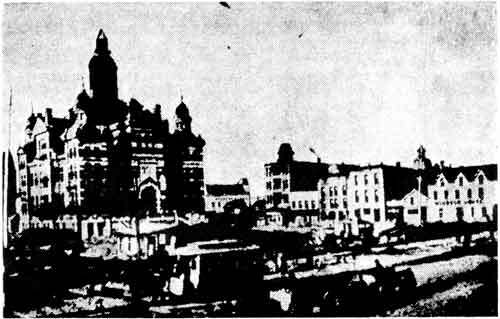 Horse-drawn streetcar in front of Winnipeg City Hall, 1885. So impressive was this beginning that the following year a new company obtained a franchise to run electric street cars in Winnipeg. From this time on the days of the horse-cars were numbered. Nevertheless, for over two years they gave serious competition to the electric cars. There were four car tracks on Main Street in those days. The horse-cars ran on the inner tracks - the electric cars on the outer ones. This was a period of competition and fares were drastically reduced, much to the joy of the riding public. The horse-car company started selling tickets at fifty for one dollar. The electric car company followed suit. There was even talk of a one cent fare. The cut-prices lasted until 1894, when the legal battle, started by Mr. Austin in a vain effort to protect his franchise, was finally settled. Horse-drawn streetcar at corner of Portage and Main, 1886. People were partisan in that period and horse-car passengers overlooked no opportunity to jeer and gibe at passengers in stalled electric vehicles. The winter time gave them plenty of scope. The electric car axles, brittle in the severe cold, broke easily; so did the trolley poles which were made of wood in those days. Trolley wires, tightening up in the rigid temperatures, also broke often. This happened particularly at switches and de-wired trolley poles frequently brought the wires down, too. Horse-car passengers, driving breezily past the stalled vehicles were loud in voicing their derision and more than one hectic battle resulted. When the Privy Council ruled against Mr. Austin in 1894, the horse-car era ended. It became official on May 12 of that year when Mr. Austin sold his holdings to the Winnipeg Electric Street Railway Company for $175,000.00. It has been said that the horse-car era might have lasted longer had not a disastrous fire destroyed over forty horses and some of the cars of the Company. That is doubtful  it would simply have delayed the inevitable. The new Company disposed of the horses and stables within three months. Forty-two employees of the horse-car company were paid off. The horse-cars themselves, proud pioneers of mass transportation in Winnipeg, ended up in Fern Glen Park, along the banks of the Red River, where they were placed as an attraction to campers and there they remained until time and usage brought about their complete disappearance.